Q. What do you do at Visit Anchorage? We bring business to Anchorage! 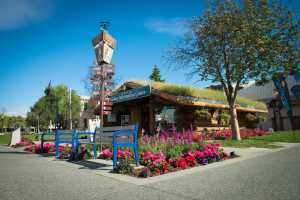 Visit Anchorage’s mission is to attract and serve visitors to the Municipality of Anchorage. Visit Anchorage, like other convention and visitor bureaus, is a nonprofit organization charged with representing a specific destination and helping the long-term development of the community through the strategic development of the visitor and meetings industries. Visitors, residents, travel agents, tour operators, media and meeting planners contact a convention and visitors bureau to receive official destination information. As an unbiased resource, CVBs provide each of these audiences with information to help in their decision-making process. Visit Anchorage is also a partner for local businesses, helping to educate and promote member companies. Q. So what do you sell? Our organization markets Anchorage. That’s our whole focus! For our members, we serve as a trusted portal that helps facilitate sales, but we don’t actually sell their products. For example, we market Anchorage as a destination to meeting planners, but the actual bookings are done by Anchorage businesses. Meetings and conventions bring millions of dollars to Anchorage in the form of visitor spending. Through our programs, we are able to leverage our collective marketing power for the good of the city and of individual members, allowing many to make inroads into markets they wouldn’t be unable to access as individual business. Q. Why does Visit Anchorage get to use the bed tax? The bed tax was created to market Anchorage as a destination. Proposed in 1975, the intention of the bed tax was to create a collective Destination Marketing Organization (DMO) to attract and serve visitors to Anchorage. In effect, the visitor industry chose to tax itself to fund marketing efforts instead of looking to municipal, state or federal funds. Q. Why does the Municipality get some of the bed tax? In 1979, the bed tax rose from 5 to 8 percent, enabling the industry to support not only marketing Anchorage, but allowing for a contribution to the MOA general fund. and one-third supports the marketing functions of Visit Anchorage. Visit Anchorage’s marketing efforts are supplemented by member contributions through annual dues, paid advertising opportunities and marketing program fees. Q. How much are you getting from the bed tax this year? Bed tax collections in 2016 totaled more than $22.6 million. They have averaged more than $22 million annually since 2008. Q. What do you do with the bed tax money? Visit Anchorage works diligently to maximize the impact of its marketing dollars. We have four departments that look to separate markets to entice convention, business and leisure travelers to our city throughout the year. Read about the multitude of ways Visit Anchorage markets the city by department. Visit Anchorage is guided by a volunteer board of directors from the Anchorage visitor industry. These are business people who are committed to furthering Anchorage as a visitor and meeting destination; the organization’s success has a direct impact on their individual business or organization. Directors represent 10 membership categories and are elected by their peers – the member businesses of Visit Anchorage. In addition to membership elected directors, the Municipality of Anchorage is also on the board. Visit Anchorage provides monthly reports to the board, quarterly reports to the Municipality of Anchorage and an annual Report to the Community that is open to the public. Q. Why should we invest in tourism marketing? Destination marketing is a very competitive business. Visit Anchorage’s efforts keep our city top-of-mind with the traveling public, infusing much-needed visitor dollars into our community. These dollars allow for year-round employment, generate revenue for more than 1,000 local businesses and keep our quality-of-life high by making it profitable for restaurants and entertainment options to remain open throughout the year, benefiting residents.